:Funny moments, poignant moments, moments we'd rather forget. Like it or not, senior moments happen. We might as well laugh about them and thank God for the way they add interest to our lives. After all, what would life be without the phone ringing faintly from inside the fridge? Some senior moments are more heartbreaking or embarrassing than funny. But in every case, we can take them to the Lord who cares for us. Each of the ninety-plus short pieces in this encouraging book contains a note to God about a topic of special interest to those who still can't believe we qualify for a senior discount. Readers will smile, laugh, and maybe even sigh and shed a tear as they recognize the unique frustrations and joys that come with getting older. About "Help, Lord! 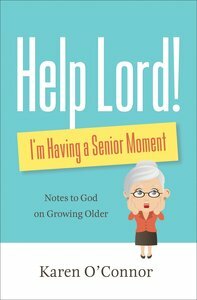 I'm Having a Senior Moment: Notes to God on Growing Older (Repackaged)"
"KAREN O'CONNOR " has written more than 50 books, including Squeeze the Moment, Help, Lord! I?m Having a Senior Moment! and Help, Lord! I?m Having a Senior Moment?Again! She is a popular speaker, instructor and consultant who has appeared on many national and international television and radio programs, including The 700 Club and the Sally Jessy Raphael Show. She is the recipient of The San Diego Writers Guild 1997 Author of the Year Award, and the 2002 Mount Hermon Special Recognition Award. She and her husband, Charles, have five children and make their home in Watsonville, California.ý?